"Yes, I did receive the angel, and I can not seem to find the words to discribe how wonderful it is. 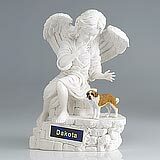 I know my Tyler is in good hands, and I am reminded of it every time I look at the angel. I really appreciate your kindness during this hard time. 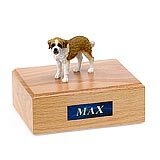 Hopefully I will not need your services again for a long time, but be assured, if necessary, I will. I will also be referring you to everyone I know." 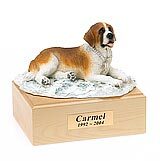 All available Saint Bernard dog urns and memorials will be displayed with the figurine on the Saint Bernard urn you select and in the appropriate size.